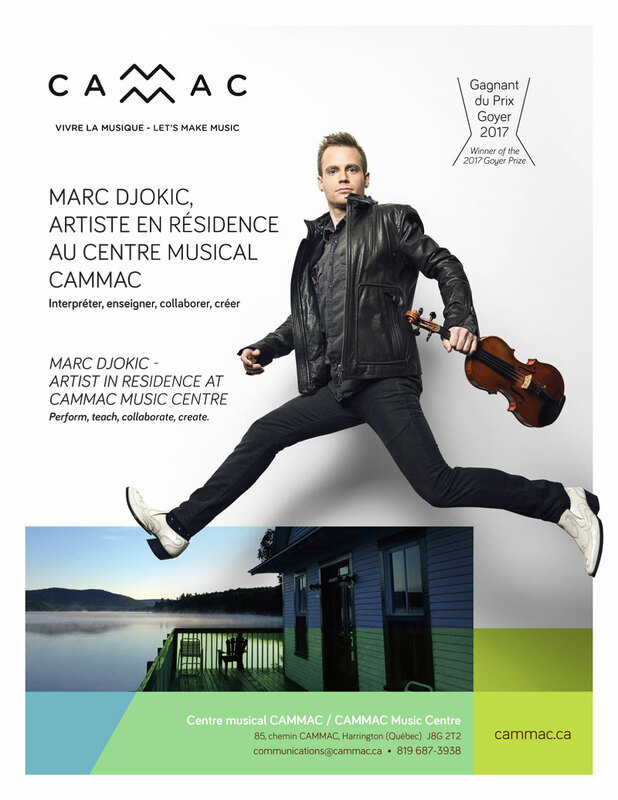 CAMMAC Music Centre is delighted to announce that violinist Marc Djokic will be Artist-in-residence at CAMMAC for the 2017-2018 season. With this residency, he will contribute to CAMMAC’s mission of encouraging people of all ages to experience the joy of making music together in a welcoming and supportive environment. As an active professional musician, he has had the privilege of collaborating with renowned artists, has regularly taught chamber groups at music festivals and given master classes, and has commissioned several works by Canadian composers. With this new initiative, CAMMAC is looking resolutely toward the future, pursuing what have always been its core goals: broadening its role as a cultural leader in its region, focussing on educating future audiences, offering introductory and more advanced training for amateur musicians, forming partnerships with high-calibre professional musicians and well-known musical ensembles, and being a gathering place for generations of families. This announcement is timely since Marc Djokic has just received the second biennial Prix Goyer award. The prestigious Prix Goyer is Canada’s largest prize for classical music. Awarded to a ‘collaborative emerging musician’, the prize is valued at $125,000. The Prix Goyer was created in 2015 and named in honour of the late Jean-Pierre Goyer, a lawyer and former Canadian Cabinet minister who was very active in the cultural life of Montreal and of Canada in general, and served as Chair of the Conseil des arts de Montréal and of the Orchestre Métropolitain. In the course of this residency, Marc Djokic will teach, perform concerts and use one of the studio spaces at CAMMAC periodically to research new repertoire as well as to rehearse contemporary and classical repertoire for solo violin and chamber groups. He will also have a Canadian work composed and premiered at CAMMAC, using the history of the CAMMAC Music Centre in the Laurentians as a point of inspiration. Founded in 1953 as a non-profit cultural organization that became CAMMAC in 1959, the reputation of and appreciation for the Center never cease to grow within the communities of amateur and professional musicians across Canada and the world. The CAMMAC Music Centre is dedicated encouraging people of all ages to experience the joy of making music together in a welcoming, supportive environment. The CAMMAC Music Center presents two major events during the summer: seven thematic week-long music retreats for amateurs of all levels and ages, and the Musical Sundays Festival. It also offers musical experiences for amateurs of all ages during the Thanksgiving weekend and the March break.